EIT InnoEnergy, Europe’s sustainable energy engine supported by the EIT, announces the cut-off date for applications to its 2018 Investment Round for supporting revolutionary, cleantech and sustainable energy innovations. Innovators looking for investment before the end of the year must apply by 4 October to receive their support in time. Investments up to EUR 5 million are expected. During seven years of operation, InnoEnergy has invested in innovative projects with a total value of € 2 billion. Since launching the Investment Round in 2011, EIT InnoEnergy has invested €190 million in projects spanning eight technology areas across Europe – resulting in €3 billion of forecasted sales. 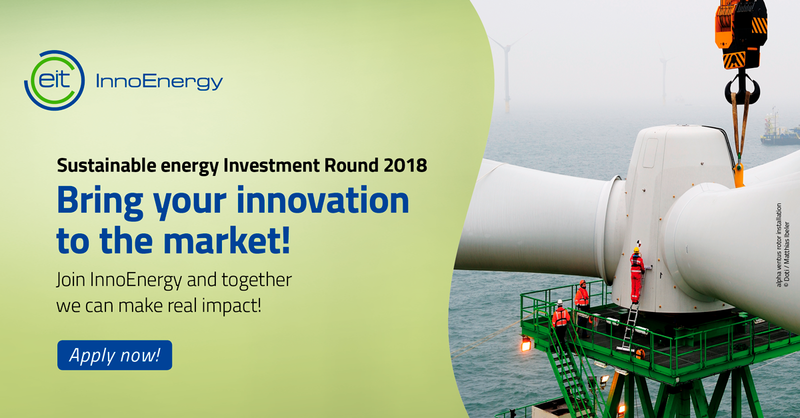 On top of funding, EIT InnoEnergy offers applicants a trusted and proven, collaborative innovation platform and access to an energy innovation ecosystem of more than 385 industry partners from across the mix of sustainable energy solutions. Lithuanian companies have also been supported by InnoEnergy. Recently funding has been provided to smart home professionals “Būsto Automatika“. Startup “WellParko“ participated in InnoEnergy‘s competition of sustainable energy “PowerUp!” and won the 2nd place in Europe. “WellParko” suggested artificial intelligence algorithms that allow getting real-time information about available parking slots, thus helping to reduce the amount of traffic jams and CO2 emissions. In the neighbor countries, “InnoEnergy” has invested in such startups as “Skeleton Technologies” from Estonia, “Hygen” from Latvia and others. “Innovation and technological advancement are key to a successful, sustainable and changing energy sector. We are glad to see the innovative and internationally competitive solutions offered by Lithuanian companies. Existing examples of success prove that Lithuanian companies, startups, university researchers and innovators have the desired potential”, – thinks Kęstutis Morkūnas, head of “InnoEnergy“ HUB in Lithuania. Jakub Miler, CEO of EIT InnoEnergy Central Europe says: “It is our mission to accelerate the clean energy transition in Europe. So, we are identifying, investing in and partnering with the very best and brightest innovators in the sector to help them scale-up, reduce their time to market and ultimately commercialize their technology. And I mean true partnership. We go beyond the mere contribution of cash to help our partners grow. Not only do we provide access to Europe’s leading network of cleantech and sustainable energy expertise, but we provide sustained support through marketing and other value-building services”. EIT InnoEnergy task is to identify and enable access to partners who help them define and provide them with access to their target group when launching a new solution. Using the support, it is possible to accelerate a moment of the products start. Starting with a large-scale production is one of the phases that requires more investment. EIT InnoEnergy provides knowledge and helps avoid common mistakes that might hinder the industrialization process. Businesses can find out more about the Investment Round, including how to apply, via this link. InnoEnergy is a fund investing in solutions in the area of energy, cleantech, mobility and broadly understood smart technologies. Through knowledge, financing, and network of contacts, we support the commercialization of products and their introduction to international markets. InnoEnergy is present in forty countries, where we cooperate with more than three hundred partners – the largest industrial concerns, leading research and academic centers and innovative entrepreneurs, investing about € 100 million annually in solutions that increase the competitiveness of our economy thanks to the cleaner, better and more efficient technologies.